A new research report, written by TrollBusters founder Dr. Michelle Ferrier, shows significant short- and long-term effects for women journalists facing online abuse, including changes to their reporting routines and censoring of topics covered. In most cases, this abuse goes unreported to management, as women journalists fear retribution, including removal from assignments and their jobs. The Fall 2018 report, Attacks and Harassment: The Impact on Female Journalists and their Reporting, released in conjunction with the International Women’s Media Foundation and with funding from the Craig Newmark Philanthropies, provides a sobering view of female journalists and the digital culture in which they do their work. These new findings, which detail the short- and long-term impact of online harassment on more than 600 individual journalists, freelancers, media workers and others, also illuminates the changing nature of the attacks. The survey was distributed to women journalists around the globe during January 2018- March 2018. It is against this global backdrop that these 600 women journalists shared the myriad ways they are threatened and attacked online and off and the impact on their work. In the era of #MeToo and #TimesUp movements in the United States, female journalists the world over feel the constant pain of a hostile work environment. Women journalists receive daily threats via social media, email, and other digital forms. However, female journalists also fear surveillance of their online activities, with 37 percent citing surveillance as a concern. Another 26 percent have received unsolicited invitations of a sexual nature. Nearly a quarter of the respondents (21%) indicated that their family and friends had been threatened too. Nearly a quarter (24 percent), indicated that the online threats and harassment had interfered with or negatively impacted their career development. Sixty-seven percent (67%) say that in the last five years, online threats or harassment are occurring much more often. The same number also say that physical attacks are on the rise as well, with attacks occurring more often in the past five years. Women journalists report a variety of ways in which they are attacked and stalked online, in gendered, sexist ways. Sixty-five percent (65%) indicate they have experienced sexist comments within the past year; 29 percent say they’ve received racist comments; 28 percent say someone has verbally attacked them to their face. Eighteen percent (18%) say they have been stalked in the past year. Thirty-six percent (36%) cite concerns of psychological stress, while nearly half (48 percent) fear a loss of job or income. More than 50 percent (52%) fear the loss of future employment opportunities. More than a third (37%) say they avoided certain stories after online attacks. Nearly a third (29%) indicated they they thought about getting out of the field/profession. 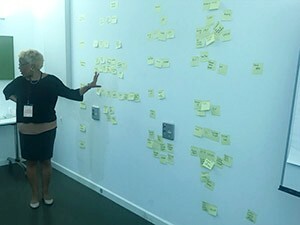 In conjunction with the John S. and James L. Knight Foundation and the International Women’s Media Foundation, TrollBusters Founder Dr. Michelle Ferrier will be co-leading a workshop to develop strategic initiatives for female journalists under attack online. “Online Harassment of Female Journalists: From Impact to Action,” will be hosted on Thursday, September 13, from noon to 1:30 p.m. at the J.W. Marriott Austin Hotel in Austin, Texas. Building on the gap analysis Ferrier led at the Internet Freedom Forum, the invitation-only workshop will share a new report funded by the Craig Newmark Philanthropies on the impact of online and physical abuse on journalists. We will discuss policies, strategies, tactics and management best practices for addressing this persistent and dangerous issue. Contact report@troll-busters.com if you will be attending the Online News Association and have a contribution to bring to the dialogue. This is NOT a drill. 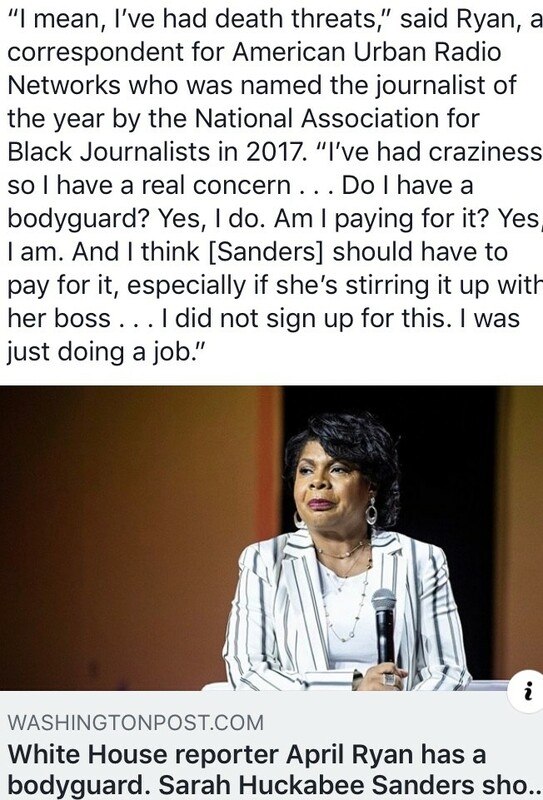 White House correspondent April Ryan says she pays for a bodyguard, after repeated death threats. Many police departments post mugshots online to name and shame those arrested. Recently the online posts of Berkeley Police Department were used by websites coordinating White Lives Matter rallies to target protestors. The doxing of those who have been placed in public view causes their continued harassment. Read about our client and the continued fights over Mugshots.com, the company using off-shore servers to continue to operate. While alt-right conspiracy theorist Alex Jones and his Infowars is in the center of a public debate about Internet platforms censoring content, these websites control public discourse using algorithms that protect some offensive content while deleting other content. Parents of children who were targeted at the Sandy Hook Elementary School are still trying to prove that the shooting wasn’t a hoax. Conspiracy theorists have been rampantly using the internet to spread misinformation about the incident but some websites are protecting these conspiracy attacks more than others. When Orange is the New Black star Ruby Rose, an openly lesbian actress, was cast to play the lesbian Batwoman, it was a historic moment for queer representation in the media. That is until trolls harassed Rose so much, she quit Twitter. Student press are increasingly under attack from coordinated external groups seeking to target an individual journalist or fracture an already contentious campus atmosphere. Gershon Harrell of the KentWired.com reports in April 2018 that Madison Newingham, a liberal political activist and junior double majoring in political science and history, drew the attention of internet trolls for her columns in The Kent Stater. Figure 1. Madison Newingham leads a pro-choice rally. Newingham says she became uncomfortable speaking in public and stayed off campus as much as she could. Encountering these online attacks early may derail these young journalists from their career paths. Many rethink their professional paths, choosing strategic communication, public relations, or other communication fields where they can limit public exposure. Students should think about how they use social media and consider changing their names or setting up separate professional accounts as they move on through the profession. Set up separate phone lines for professional and personal calls. Same with email. Get your own domain name. Set up a website. Make sure your name is the top result/first page on search engines. Use a post office box to remove a physical footprint to your doorstep. Set up privacy protections on any domain names you own. The recent deaths of five journalists at the Capital Gazette in Annapolis, Maryland on Thursday underscore the hostile environment journalists are experiencing here in the United States. News organizations are reporting that the shooter had a long-standing anger at the newspaper for coverage surrounding a stalking charge reported from a police report. The shooter used a variety of social media accounts to lob jabs and physical threats at the newspaper staff over the years and filed and lost a defamation lawsuit against the organization. And most recent reports indicate that the shooter had also sent threatening letters to the news organization just days before this attack on Thursday, reports NBC. The 2:33 pm shootings at the Capital Gazette headquarters were preceded by years of online attacks against the organization and its personnel. The subject line of TrollBusters’ 8 a.m. Thursday morning newsletter: Underestimating online threats can be deadly. We were referring to the recent death of a Japanese blogger who was giving a talk on online harassment, when his online stalker met him after the talk and killed the blogger. We did not know it would become the epitaph for our colleagues at the Capital Gazette. “People are going to say that journalists are overreacting,” tweeted Anne Helen Petersen, a Buzzfeed reporter cited by the Associated Press who said she’s received emailed death threats and someone who threatened to slit her dog’s throat. In today’s Boston Globe, @NotesfromHel describes the hate she and other women journalists of color have endured for years. Death threats should not be part of the job, Helen Ubinas, wrote in her column “The hate we get: Why journalists need to stop accepting threats as part of the job.” Ubinas describes why she has publicized these audio, text and verbal threats that she receives on every platform. “That was BS then. And it’s BS now.” calls Ubinas. As founder of TrollBusters, I too hold “receipts” of the years of hate mail I received as the first African-American columnist at a Florida newspaper. My experiences led me to create TrollBusters to support journalists from online threats and provide coaching to media organizations on navigating digital threats. TrollBusters joins with the Associated Press Media Editors and the American Society of News Editors, in honoring our Capital Gazette colleagues this Thursday, July 5 at 2:33 p.m. with a moment of silence. The organizations have issued this list of safety practices to protect against physical attack. However, the document does not provide management guidance on how to navigate online threats — before they result in physical attacks. TrollBusters provides coaching, infographics, education and training work and a growing consortium of organizations are working to combat online abuse and threats, particularly among journalists. This week, TrollBusters is releasing its Global Safety Resource Hub, a geotagged directory of country-specific resources and organizations working to combat online abuse and threats against journalists. The Google map includes journalism professional organizations, governmental organizations, nonprofit organizations, training and education institutions, professional organizations and others working around the globe on online harassment and privacy issues. We want our colleagues around the world to be able to receive just-in-time resources to combat online and physical threats. We invite you to suggest additional global resources to protect journalists under attack at report@troll-busters.com. Educate management on the challenges journalists face in the field and assist management with devising strategy for prevention and greater security (both physical and digital). Publish attacks on media sites to call attention to circulating rumors; support your journalists and their work. Take threats more seriously by investigating and/or providing security while working. Close off commenting on an article that is drawing fire. Provide additional personnel on live shots or Facebook Live shoots. Dr. Michelle Ferrier is the founder of TrollBusters: Online Pest Control for Journalists. Report #onlineabuse #onlineharassment @yoursosteam, report@troll-busters.com and http://www.troll-busters.com. TrollBusters has developed a map of country-specific resources to help journalists find technical, legal and governmental assistance when they are attack online. Mugshots.com owners Sahar Sarid, Kishore Vidya Bhavnanie, Thomas Keesee, and David Usdan were arrested last week on charges of extortion, money laundering and identity theft. Their online platform featured public record mug shots of those who encounter the U.S. justice system, whether on warrant or spurious charges. Those people featured in these mug shots are required to pay removal fees to get the images taken down, with some costs up to $400. While the Mugshots.com features a Federal Credit Reporting Act disclaimer saying the information on the site should not be used for credit, employment or other decisions, the website has in fact operated as such, ruining lives as its owners pocketed more than $2 million in removal fees from desperate people featured on the site. TrollBusters worked with our client, a White male photographer who worked teaching at a Southeastern university and doing photography for a local newspaper, who briefly dated a White woman. She ruined our client’s life using Mugshots.com imagery, imposter sites and a combination of physical stalking charges to discredit, dishonor and destroy our client’s life. We’ll call this woman Becky for short. Her full name is Darth Beckyzilla of the Digital Underworld and Keeper of the Toxic White Tears. But Becky for our purposes. Here is Bart Christner’s story as told to two of the judges that he’d been hauled in front of by Becky. TrollBusters worked with Bart to present his case to law enforcement, the courts, employers and others to regain his reputation. MugShots.com preyed on people like Bart Christner and exploited his reputation for their profit. Today, Bart’s photo is still on Mugshots.com, right where the mug shots of Sahar Sarid, Kishore Vidya Bhavnanie, Thomas Keesee, and David Usdan should be. As of this post, Mugshots.com has stopped updating its website. BELOW: Witness Letter-TrollBusters, December 9, 2015. Letter to the courts on behalf of TrollBusters’ client, Bart Christner.